There’s nothing wrong with censorship: if we didn’t have it you would know I ****** your ****** last night. See? I protected you. Stop crying or I’ll do it again! 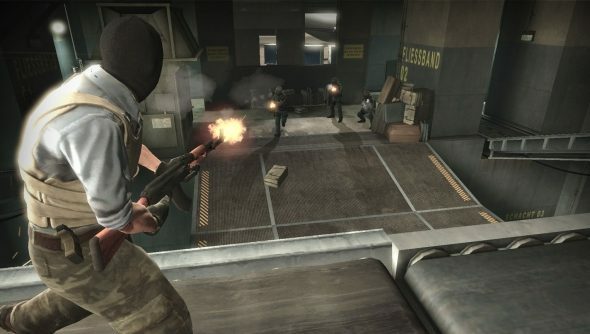 Valve have a long history of having to do the same with their games, particularly Counter-Strike, in Germany, and the upcoming Counter-Strike: Global Offensive will be censored as well. The files that show the new death animations have been discovered in the recently released CS: GO beta. Deaths in the German Counter-Strike just don’t happen. You pump round after round of expensive bulletry into the Terrorist scum or oppressive Counter-Terrorist puppets they’ll stop. And give up. It’s kind of sad that they have to undermine the work they’ve put into the guns and action like this. The change is in accordance to edicts laid down by the “Federal Department for Media Harmful to Young Persons”, which stipulates that freedom of expression and isn’t guaranteed if they consider it potentially harmful to German children. Any games deemed harmful to children, showing “excessive” amounts of violence will be added to the “List of media harmful to young people”, and only be sold by request to adults of 18 years and older. Now that’s fine, but more damagingly to the game they’re not allowed to advertised in stores or the media. Basically you have to know the game’s on sale in order to be able to buy it, as you’ll never be told otherwise.Valve’s method of getting around this is to remove the violence completely, ensuring the game passes scrutiny while neutering the violence. It’s a trick they’ve employed since Half-Life, where the removed all injuries and gibs, the scientists simply sit down and shake their heads if you shoot at them, and the enemy soldiers were replaced by death-bots.In Team Fortress 2, death results in the player exploding in a pile of presents and random, silly items. Left 4 Dead got around the ruling by having the zombies simply melt away into nothingness, although a puff of blood hangs in the air and corrupts the youth. German gamers usually find a workaround, but there are those that will never understand the simple pleasure of seeing a Demoman’s kidneys. Of course, I now worry that German gamers will think that I have presents inside me and want to get at them, or that if they shoot at me I’ll lie on the ground and lock my fingers behind my head. This is a relationship with violence I’m rather uneasy about: not showing the consequences of pumping bullets into someone, although games in general gloss over the full effects, is surely more dangerous than the make believe on display here? I want people to understand that gund and knives hurt people.I’m actually curious to know the full impact it has on the game: if this is all you know, are you likely to care all that much that there’s an alternative? What other options are there for a game about shooting that Valve could implement?